This week for Take a Stitch Tuesday (TAST), the featured stitch is the running stitch. According to Wikipedia, the "running stitch or straight stitch is the basic stitch in hand-sewing and embroidery, on which all other forms of sewing are based. "The stitch is worked by passing the needle in and out of the fabric. Running stitches may be of varying length, but typically more thread is visible on the top of the sewing than on the underside." What could be a rather dull stitch can actually be presented in many different ways by simply varying the stitch length and using a variety of colors of embroidery floss. Throughout the world there are many forms of the running stitch. 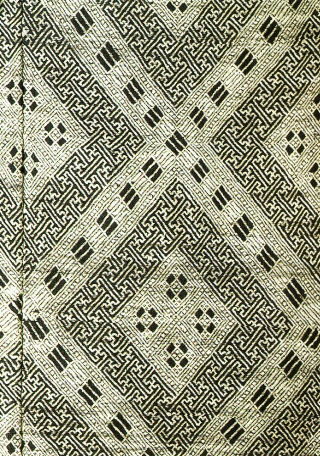 For example, kogin is a traditional embroidery from the northern part of japan. Originally kogin was used as a form of darning or reinforcing work clothes. The patterns became more beautiful and were known for their intricate designs. Kogin is most commonly done with white thread on an indigo blue background. 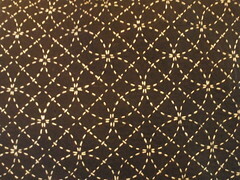 On Needleprint it said that "...Kogin [is] a form of sashiko. It was developed in the Aomori Prefecture which is in the Tohoku region. In the early 1700s, farmers were prohibited from using cotton for work clothes; only linen was allowed. "In order to keep warm (this area is buried in deep snow in winter), the women darned threads between the gaps of rough linen cloth to make it stronger and warmer. Later, the darning took on decorative patterns and the women would present their best Kogin works as festive wear. The Kogin patterns symbolized nature such as the dragonfly, nuts, butterflies, etc." green lines to mark where to stitch. Sashiko patterns are typically traced onto the right side of the ground fabric and then stitched with 5-8 small, even stitches per inch along the pattern lines. 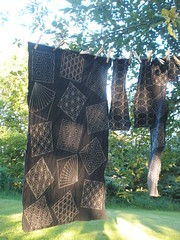 One of the sashiko patterns I embroidered in 2010. This one was made into a pillow. Traditional sashiko patterns are done with white thread on indigo ground fabric but modern sashiko is now done with multi-colored thread on various types of ground, including silk. I washed each piece of fabric to remove the gold marks. I dried it on the clothesline and then ironed the fabric. What remains are the white stitches on indigo fabric. 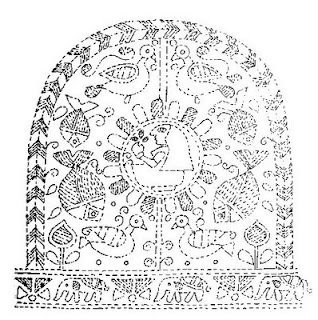 Kogin embroidery is done on evenweave fabric and is stitched as an over/under darning pattern. In order to create the pattern, the horizontal stitches vary in length. a darker shade of blue (D). So, the pattern is: L, M, D, M, L, M, D, M, L.
Traditional kogin embroidery was also done with white thread on indigo ground but modern kogin embroidery can be done with any thread you choose on any ground you choose. 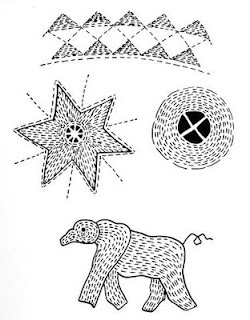 This pattern is from a kogin pattern book. thicker white thread/floss which (I thought) looked a lot better. Another part of the world also has a type of embroidery that uses the running stitch. On Wikipedia, it says that "Kantha is a type of embroidery popular in Bangladesh and in West Bengal, India. The use of kantha is popular in kantha sarais traditionally worn by women in Bengal, but any garment or cloth with kantha embroidery, predominantly having a border of decorative running stitch motifs, may be called a kantha garment." Kantha stitching is also used to make simple quilts, commonly known as nakshi kantha. Women in Bengal typically use old saris and cloth and layer them with kantha stitch to make a light blanket, throw, or bedspread, especially for children. Kantha is similar to the decorative running stitch of Japanese sashiko quilting. Kantha originated from the way in which Bengali housewives mended old clothes by taking out a strand of thread from the colorful border of their saris and making simple designs with them. For this week's TAST, I did the running stitch on Aida cloth as well as pre-printed cloth that had green lines. These lines did not wash out of the fabric like the lines on traditional sashiko fabric. I wrote a short journal entry, did a list of things for which I am grateful, and included the stitch name. My embroidery journal entry and samples for the week. I also added a couple of images from greeting cards that were in my dad's office since I'm still going through his files and two offices at home (one for his persona/business use and one for being a Deacon). It's been a long process so far - with lots of work ahead - but it has been a helpful thing to do in the grieving process. The quote is one that I found in his items and truly reflects the way that he lived his life - to the fullest and positively affecting literally thousands of people. I didn't think those other decorative stitchings were running stitch. Learned something. I can see they are when you look closely. Interesting histories of uses in other countries, too. What an interessant and detail topic on running stitch. thanks for sharing. I would not have thought to use the running stitch on a printed fabric, but it looks really good! It's a beautiful work! Excellent post! I enjoyed reading the history and seeing your examples. Dear Ann, this is wonderful pages you made in your journal! and so interesting post you wrote! thank you very much! You have done some amazing work and I'm glad it helps you grieve, your father sounds like he was an amazing man. Lovely stitching, beautiful post, and wonderful journal pages.. Grieving is a process, for sure.. whatever helps - just do it!! Enjoy the process and take solace in your stitching. Beautiful embroidery! I especially fell for the circle patterns and how different -- but equally gorgeous -- they look stitched on dark fabric and on light, patterned fabric. Very inspirational! You do lovely work, and I wondered if you use a hoop to keep your stitches so perfect? My name is Ann, and I'm a mom to two daughters who were adopted from China. I'm also a crafter; writer; and someone who always seems to have a camera in hand. In this space, I share some articles and photos about homeschooling; frugal living; arts and crafts; cooking; nature walks; natural living; books; and needlework. See what inspires the creation of products available through Harvest Moon by Hand. If you would like to contact me or have any questions, please leave a comment on a post with your email address and/or contact information. Look around, make yourself comfortable, and enjoy your stay. I'm so glad you're here! Is the Prague City Card Worth It? What does the Golden Mean? Drawing the plan detail for the original Chilton Carden Ford prototype tail. SUMMER 2012 SCHEDULE COMING SOON. and the voting begins... PUMPKIN PATCH! My Alice in Wonderland Dolls are now being Represented by a Gallery!!!!! !